See, after months, MONTHS of flower-girling our yard with lemon peels and orange peels, and white peppering our hedges, and sweeping – oh, SWEEPING – our courtyard every other day, only for the soil to miraculously un-dig itself onto our now grubby, soil streaked courtyard… After months, MONTHS of watching the hole in our hedge get from tennis ball to basketball to hello-you-can-birth-an-elephant-here… I decided that short of running out and spending oodles on toxic mongrel-deflecting chemicals, I’d drive down south and get me a cat cage trap thing. “Er… no. 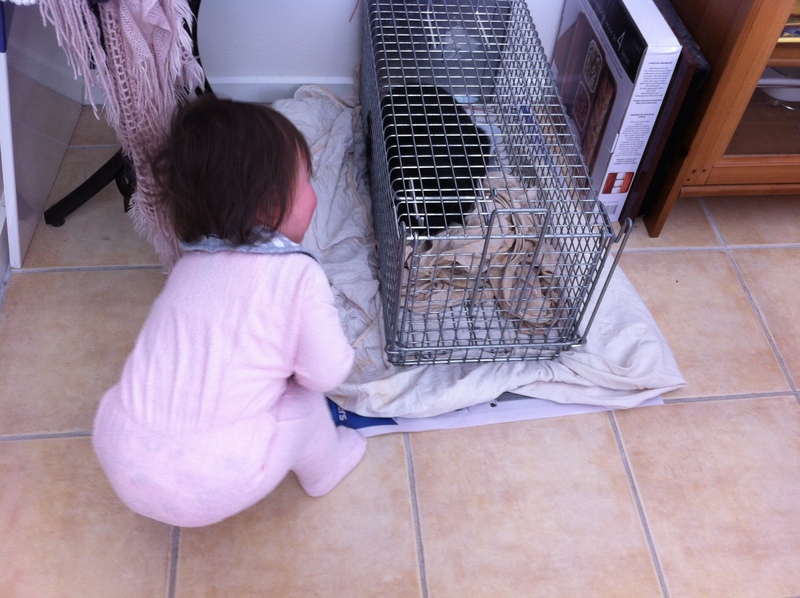 I think it’s a cat… but maybe it’s a small dog?” I wanted to say “small, stupid mongrel dog” after seeing yesterday’s mess, but I was frankly scared of the RSPCA folk and felt cruel just asking for a cage trap thing as it is. I had also just learnt, while filling out the paperwork, that there’s a $10,000 fine for animal cruelty. She gave me one of those patient stares that made me feel like a twit. So last night, I spent 69¢ on the smelliest cat food I could think of (sardines in jelly), got home, padded out the cage with old bedsheets, set the trap, covered the cage with blankets so it was extra nice and warm and enticing, and went to sleep. This morning, we bunny-slipper silently to the sliding doors and peek out into the courtyard. Yard rummaged. Sardines eaten. Trap door closed. Cat in trap. Arddun is having her breakfast in the highchair. Tony is in bed with a bad case of the flu. I bring the cat into the house where it’s warm. Cat mews. Arddun is stoked, so we have a hiatus on the breakfast, and Arddun gets to run to the cage and have a point-and-stare. We place the toddler back into the highchair where it’s safe. And then we walk back to see if there’s a collar. There’s a collar. Dang. Can’t tell if there’s an address tag. There’s something dangling around the collar, but I cannot tell because he/she won’t let me. I cannot see anything. Who friggin’ buys a black collar for a black cat? The cat gets out. The cat bolts for the guest room. What-are-you-doing, asks sick and grumpy husband who has padded out to the living room. Husband gives half-hearted attempt in his flu-addled state. I send him back to bed in exasperation. Toddler still dizzy with excitement, and chirping “BIRD! BIRD!” from high chair. CAT MAKES BREAK FOR FREEDOM! AND RUNS INTO WINDOW! CRAP. Trap door falls shut in skirmish. Yell for husband, after just sending him off for not being helpful. Turns out there isn’t a tag, but a useless bell. A bird would look at it and fall off its branch, laughing at the stupidity of this useless bell. I much prefer it if the neighbour attached a loudhailer around the cat’s neck that bellows “CAT IN THE YARD” whenever it so much as lifts its leg to scratch itself near our property. Gorgeous, sleek black thing, though. Cat now back with RSPCA. Yard is swept again. Slightly nervous that I caught the wrong animal and the courtyard will be disgusting again tomorrow. But for now anyway, our yard is cat-free. HAHAHA! Sounds like quite a morning you had there. Good on you on being able to catch the cat etc. You are very brave! :) I’m sorry that the cat gave you guys so much trouble though.